Mitch Nelson, a US Army Captain with Green Berets Operational Detachment Alpha (ODA) 595, is moving into a new home with his wife and daughter on September 11, 2001, after receiving an assignment to staff duty under LTC Bowers. As news of the devastating terrorist attacks that day break, Nelson volunteers to lead 595 into Afghanistan. Bowers initially refuses, but veteran soldier CW5 Hal Spencer, previously scheduled to retire, persuades Bowers to give Nelson command of 595 again, as well as volunteering himself for the deployment. After leaving their families, 595 travels to Uzbekistan on October 7, 2001. After being briefed and evaluated by COL Mulholland, Commander of 5th Special Forces Group, Nelson and 595 are picked to fight alongside Northern Alliance leader Abdul Rashid Dostum. ODA 595 is inserted covertly in Afghanistan aboard an MH-47 Chinook flown by 160th SOAR. They land 40 miles south of Mazar-i Sharif, the country's fourth-largest city and a longtime stronghold of the Taliban, where they meet Dostum. Six of the 12 members, led by Nelson, leave with Dostum to the mountains, while the other six remain in a fortified camp nicknamed "The Alamo" under Spencer's command. Dostum is attempting to capture the northern Afghanistan city, while battling Taliban leader Mullah Razzan, who rules local communities brutally under strict Sharia law, and has murdered several people, including Dostum's family. Although the warlord is initially skeptical of Nelson's abilities, Nelson gradually earns Dostum's respect. In one battle, however, Dostum makes a tactical error, costing several casualties. Nelson accuses Dostum of acting carelessly with the lives of his men and of withholding valuable information, while Dostum retorts that he still feels that Nelson, and the U.S., is not willing to pay the potential price of the conflict, and tells Nelson that he needs to use his heart and mind to "be a warrior" instead of a soldier. The two eventually reconcile, and, after splitting off a three-man element under SFC Sam Diller to strike a Taliban supply route, and being joined by Spencer's half of ODA 595, continue to work together. They win several victories with Dostum's leadership and manpower and American airpower, making significant progress towards Mazar-i Sharif. Suddenly, however, Spencer informs Nelson that another ODA, 555, has been dispatched to support Atta Muhammad, another Northern Alliance leader, who is Dostum's political rival. When Nelson is forced to tell Dostum, the furious warlord and his men promptly abandon 595. Following Dostum's departure, Nelson plans to continue operating against the Taliban with his Americans and the few Afghan fighters remaining with them. Encountering a large force of Al-Qaeda and Taliban fighters and armored vehicles, ODA 595, rejoined by Diller and his element, uses air support to eliminate many of the fighters and most of the armor, but are discovered and attacked. Spencer is critically injured by a suicide bomber, and the team is about to be overrun under heavy Taliban and Al-Qaeda pressure when Dostum returns with his forces. Carrying out the US Army’s first cavalry charge of the 21st century, the American and Northern Alliance forces disperse the Taliban and Al-Qaeda, and Dostum tracks down and kills Razzan. After Spencer is medevaced, Nelson and Dostum continue to Mazar-i-Sharif but find Atta Muhammad has beaten them there. Against expectations, Dostum and Muhammad meet peacefully and put aside their differences. Impressed by Nelson and the Americans' efforts, Dostum gives Nelson his prized riding crop and tells him that he will always consider Nelson a brother and fellow fighter but remember that Afghanistan is the graveyard of empires. Spencer ultimately survives, and all 12 soldiers of ODA 595 return home after 23 days of almost continuous fighting in Afghanistan. The film’s penultimate moment shows a photo of the Horse Soldier Statue in New York City, based on the soldiers of ODA 595 and their victory in the early stages of the response to the September 11th attacks, dedicated to all United States Special Forces. The film then ends with a photo of the actual members of ODA 595, in combat fatigues, upon whom 12 Strong was based. Chris Hemsworth as Captain Mitch Nelson, ODA 595’s commander, inspired by Mark Nutsch. Michael Shannon as Hal Spencer, a Chief Warrant Officer 5 and ODA 595‘s assistant team leader, inspired by Bob Pennington. 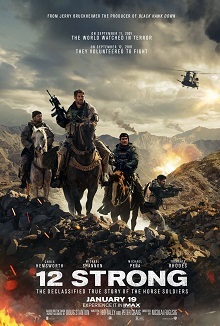 On December 2, 2011, it was announced that producer Jerry Bruckheimer had taken out the script by Ted Tally and rewritten by Peter Craig with Nicolai Fuglsig attached to direct, which was bought by Walt Disney Pictures in 2009 for Bruckheimer, based on Doug Stanton's non-fiction book Horse Soldiers. On March 29, 2016, Deadline reported that Bruckheimer had officially hired Fuglsig to make his feature film directorial debut, which would be co-financed and produced by Molly Smith, Trent Luckinbill and Thad Luckinbill through Black Label Media, along with Bruckheimer's Jerry Bruckheimer Films. On September 30, 2016, Chris Hemsworth and Michael Shannon were cast in the film, and later on November 1, Michael Peña also joined the film. On November 3, 2016, Trevante Rhodes was cast in the film. On November 14, 2016, Austin Stowell was cast in the film to play Staff Sergeant Fred Falls, an American soldier on the elite U.S. Special Forces team. Lionsgate would handle the film's distribution. On November 15, 2016, Austin Hébert was cast to play SFC Pat Essex, the intellectual and engineer of the team, and the same day it was reported that Ben O'Toole had also been cast for an unspecified role. On November 17, 2016, Variety reported that Navid Negahban was cast to play General Abdul Rashid Dostum in the film. Elsa Pataky was revealed to be appearing in the film in December 2016, while on February 3, 2017, Deadline reported that Rob Riggle joined the film to play Army Lieutenant Colonel Max Bowers, under whom Riggle actually served while he was a Marine Captain. Principal photography began in early January 2017 in New Mexico. Mines near Orogrande, New Mexico, were used. Later the shooting took place in Socorro, where it ended on January 26 after eight days of filming. The film was also shot in Alamogordo, using the White Sands National Monument as shooting location. The scenes involving military encampments were filmed using 20 structures leased from AKS Military, a private manufacturer of military shelters. Warner Bros. Home Entertainment released 12 Strong digitally April 10, and on Blu-ray Disc and DVD May 1. Blu-ray extras include the featurettes "12 Strong: The Making of an Impossible Mission" and "Monumental Effort: Building America's Response Monument." The films postscript reads as follows: "Against overwhelming odds, all twelve members of the U.S. Army Special Forces ODA 595 survived their mission. The capture of Mazar-i-Sharif by the Horse Soldiers and their counterparts is one of the US military's most stunning achievements. Military planners predicted it would take two years. Task Force Dagger did it in three weeks. Al Qaeda considers this to be their worst defeat. Because their mission was classified, the men of Special Forces ODA 595 returned home to their everyday lives with no fanfare or public acknowledgment of the near impossible mission they completed. In 2014, General Dostum became Vice President of Afghanistan. Dostum and Mitch Nelson remain close friends to this day. In 2012, to honor their extraordinary heroism, a statue of a Horse Soldier was dedicated at the World Trade Center site." 12 Strong grossed $46.7 million in the United States and Canada, and $24.1 million in other territories, for a worldwide total of $70.8 million, against a production budget of $35 million. In the United States and Canada, 12 Strong was released on January 19, 2018 alongside Den of Thieves and Forever My Girl, as well as the wide expansions of Phantom Thread, I, Tonya and Call Me by Your Name, and was projected to gross $15–20 million from 3,002 theaters in its opening weekend. It ended up debuting to $15.8 million, similar to the $16.1 million that war film 13 Hours: The Secret Soldiers of Benghazi opened to in January 2016, and finished second at the box office behind Jumanji: Welcome to the Jungle. According to ComScore, 55% of the opening weekend audience was male, with 79% being over the age of 25. The following week dropped 45% to $8.6 million, finishing 6th at the box office. On review aggregator Rotten Tomatoes, the film has an approval rating of 52% based on 157 reviews, and an average rating of 5.5/10. The website's critical consensus reads, "12 Strong has a solid cast, honorable intentions, and a thrilling, fact-based story — all of which are occasionally enough to balance a disappointing lack of depth or nuance." On Metacritic, the film has a weighted average score of 54 out of 100, based on reviews from 43 critics, indicating "mixed or average reviews". Audiences polled by CinemaScore gave the film an average grade of "A" on an A+ to F scale, while PostTrak reported filmgoers gave an 81% overall positive score and a 63% "definite recommend". Richard Roeper of the Chicago Sun-Times gave the film 2.5 out of 4 stars, saying, "...with a running time of two hours and 10 minutes, 12 Strong has at least 20 minutes of scenes that are either unnecessary or repetitive...[it] winds up being an almost-good film about some great American soldiers." ^ a b c "Film releases". Variety Insight. Retrieved April 30, 2017. ^ a b Faughnder, Ryan (January 17, 2018). "Afghanistan war film '12 Strong' to battle 'Jumanji' reboot for top box-office spot". Los Angeles Times. Retrieved January 17, 2018. ^ "12 Strong (2018)". The Numbers. Retrieved August 3, 2018. ^ "12 STRONG - British Board of Film Classification". www.bbfc.co.uk. ^ Jeff Giles (January 18, 2018). "12 Strong is a Little Flimsy". Rotten Tomatoes. Retrieved January 20, 2018. ^ Williams, Brian Glyn (2017-01-04). "The Hammer and the Horse. Chris Hemsworth (Thor from Avengers Movies), CIA, Green Berets and Afghanistan's Most Feared Warlord Unite for Epic Movie". Huffington Post. Retrieved 2017-11-24. ^ a b Kroll, Justin (September 30, 2016). "Chris Hemsworth, Michael Shannon to Star in Afghanistan War Drama 'Horse Soldiers'". Variety. Retrieved November 15, 2016. ^ "How accurate is the 12 Strong movie? Learn the true story and meet the real Horse Soldiers Special Forces team". History vs. Hollywood. 2018-01-14. Retrieved 2017-03-03. ^ a b McNary, Dave (November 1, 2016). "AFM: Michael Pena Joins Chris Hemsworth in 'Horse Soldiers'". Variety. Retrieved November 15, 2016. ^ a b Kroll, Justin (November 17, 2016). "Chris Hemsworth's Afghanistan War Drama 'Horse Soldiers' Adds 'Homeland's' Navid Negahban". Variety. Retrieved February 8, 2017. ^ a b Kit, Borys (November 3, 2016). "'Moonlight' Star Trevante Rhodes to Join Chris Hemsworth in 'Horse Soldiers' (Exclusive)". The Hollywood Reporter. Retrieved November 15, 2016. ^ a b Kroll, Justin (November 15, 2016). "'Hacksaw Ridge's' Ben O'Toole Joins Chris Hemsworth in 'Horse Soldiers' (EXCLUSIVE)". Variety. Retrieved February 8, 2017. ^ a b c N'Duka, Amanda (November 14, 2016). "Austin Stowell Cast In 'Horse Soldiers'; Rahart Adams Boards 'Pacific Rim' Sequel". Deadline Hollywood. Retrieved November 15, 2016. ^ a b N'Duka, Amanda (November 15, 2016). "'Horse Soldiers' Recruits Austin Hébert; 'Papillon' Remake Adds Nina Senicar". Deadline Hollywood. Retrieved November 16, 2016. ^ a b c Symonds, Kristy (December 7, 2016). "Hemsworth's love spills on to screen". Daily Telegraph. Retrieved February 8, 2017. ^ a b Jr, Mike Fleming (February 3, 2017). "Rob Riggle To Play His Former Army Commander In 'Horse Soldiers'". Deadline Hollywood. Retrieved February 8, 2017. ^ Jr, Mike Fleming (December 2, 2011). "Jerry Bruckheimer On The Pitch Circuit With Afghanistan War Tale 'Horse Soldiers'". Deadline Hollywood. Retrieved November 15, 2016. ^ Jaafar, Ali (March 29, 2016). "Jerry Bruckheimer Taps Nicolai Fuglsig To Direct Afghan War Pic 'Horse Soldiers' For Lionsgate". Deadline Hollywood. Retrieved November 15, 2016. ^ Turner, Scott (January 26, 2017). "Horse Soldiers to wrap up here". El Defensor Chieftain. Retrieved February 7, 2017. ^ Turner, Scott (February 2, 2017). "Show biz booming: State pulls in film industry dollars". El Defensor Chieftain. Retrieved February 7, 2017. ^ "'Horse Soldiers', starring Chris Hemsworth, is set to begin filming at New Mexico's White Sands National Monument, as well as at the Los Lunas Volcano in Los Lunas, from late January to early February". On Location Vacations. January 13, 2017. Retrieved February 7, 2017. ^ ""Horse Soldiers" film still searching for extras". Las Cruces Sun-News. January 7, 2017. Retrieved February 7, 2017. ^ "Movies That Have Featured Alaska Structures Military Systems". AKS Military. Retrieved 26 January 2018. ^ Latchem, John (March 6, 2018). "Warner Prepping '12 Strong' for Home Video Release". Media Play News. Retrieved May 2, 2018. ^ "12 Strong (2018)". Box Office Mojo. Retrieved June 7, 2018. ^ a b D'Alessandro, Anthony (January 21, 2018). "January Slows As 'Jumanji' Takes No. 1 For 3rd Weekend With $19M To $20M; Older Guy Pics '12 Strong' & 'Den Of Thieves' In Mid-Teens". Deadline Hollywood. Retrieved January 21, 2018. ^ "12 Strong (2018)". Rotten Tomatoes. Fandango Media. Retrieved August 23, 2018. ^ "12 Strong Reviews". Metacritic. CBS Interactive. Retrieved January 20, 2018. ^ Roeper, Richard (January 17, 2018). "The war horsemen ride to Afghanistan's rescue in cliché collection '12 Strong'". Chicago Sun Times. Retrieved January 18, 2018.